We were so excited to receive a copy of Harry the Happy Caterpillar Grows by Cynthia Jett, a licensed psychotherapist and social worker. This childrens' book is about how Harry, a very happy caterpillar, is so content with his life and the way things are that he becomes fearful when he learns he must build a chrysalis and morph into a butterfly. Harry reminds me a lot about me. Even though this was a book for children I really related to the little guy. And I could see that his story affected my daughters, too. They've had so many changes in life; from a new baby sister to new pets and starting school. Even the smallest change in an adult's point of view can be very overwhelming to a small child. This book is appropriate for ages 4-10, with coping strategies and discussion tips at the end. This book is part of New Horizon Press' "Let's Talk" series for young children. In the book Harry became very overwhelmed and afraid of the changes he was going to go through. He was so happy being a caterpillar that he couldn't imagine that being a butterfly could be better. But as his friends began to make the transformation he felt left behind and ultimately realized that change was going to happen whether he wanted it to or not. His teacher helped him to overcome his fear and in the end he was able to make the transformation and still be as happy as a butterfly as he was as a caterpillar! I think it is so important to encourage our children to embrace change, to let them know that changes can be fun. For instance, getting to grow a little older means getting to stay up a little later than younger siblings or that having a new baby join the family gives him the Big Boy status and lots of privileges the baby doesn't get. Or perhaps a new house means she gets to decorate a new room. There are so many changes our children can go through and I think this book does a great job of encouraging young children that changes will come in life but that they don't have to be scary, that the end result could be fun! The pictures are clear and wonderfully done with bright colors that captivate and hold your child's attention. Elaina has learned about caterpillars and butterflies in school so I think being able to relate to a subject or character that she is familiar with was also really beneficial to holding her attention on the book because she knew Harry would have to go through the metamorphosis to become a butterfly. His fear over the change was very eye-opening to my 5-year-old as she has had many fears during these early school years. 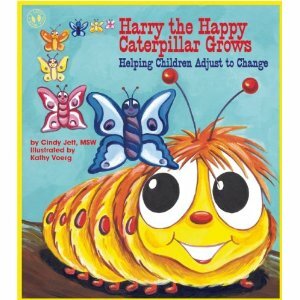 If you have big changes coming up in your lives and need a good read to help your child get through the changes I strongly recommend Harry the Happy Caterpillar which you can find at Amazon. You can also visit Harry the Happy Caterpillar for more information on the book! This was not a paid advertisement. All opinions expressed are completely honest based on our experience with the product. Our family did receive a book for free in order to give our honest opinion on the book. Thank you Cynthia!